Single mother Collette McVeigh (Andrea Riseborough) is a Republican living in Belfast with her mother and hardliner IRA brothers. When she is arrested for her part in an aborted IRA bomb plot in London, an MI5 officer named Mac (Clive Owen) offers her a choice: lose everything and go to prison for 25 years or return to Belfast to spy on her own family. With her son's life in her hands, Collette chooses to place her trust in Mac and return home, but when her brothers' secret operation is ambushed, suspicions of an informant are raised and Collette finds both herself and her family in grave danger. 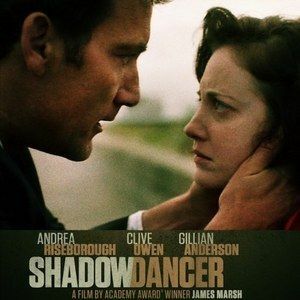 Justine Browning recently sat down with director James Marsh and his leading man and lady, Clive Owen and Andrea Riseborough, for a rousing talk about this thriller, in theaters now. Check out our exclusive video interviews, and go behind-the-scenes of Shadow Dancer.